Over the years Everett Aviation has been able to offer support to military and government operations in the region. For several years we have provided logistic and medevac support to British Army exercises in Kenya and Malawi, using our NVG and IFR capabilities to perform critical lifesaving flights in difficult weather conditions. 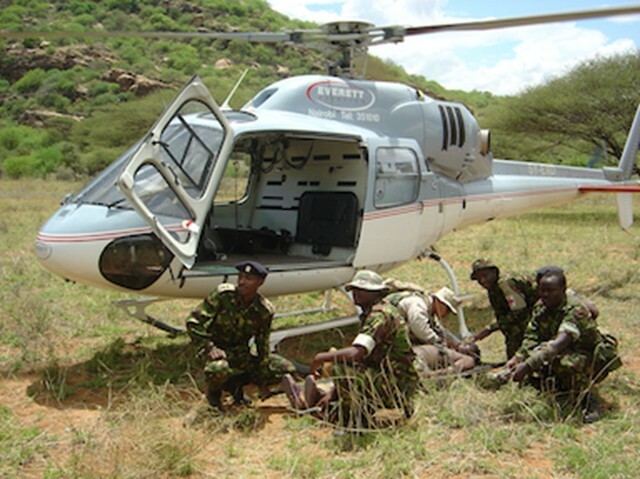 Everett Aviation AS355 in support of military training exercise in Northern Kenya. Everett Aviation has been called upon in response to various other major disasters. We have been able to assist the Kenyan government during the tragic occasion of the Embassy bombings, for which we were honoured to receive a Presidential citation. Safety is first and foremost in all of our operations. Specialised operations require a higher level of safety awareness. Pre and post flight mission briefings provide a forum to constantly analyze and risk assess each tasking ensuring diligent mitigation is implemented and the safest flight options are presented to the client. Success is achieved by the safe completion of every mission.